Lifelong rancher Marvin Cromwell is a cowboy at heart, so he never envisioned himself creating a brand, let alone using an online platform to promote it. 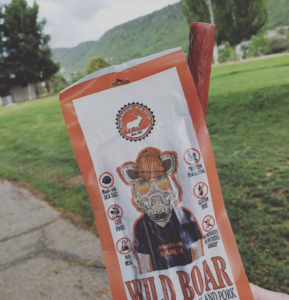 However, once his son convinced him that the ranch’s offering of elk, buffalo, venison, and wild boar jerky would be successful with retailers, Pearson Ranch Jerky expanded its retail journey with RangeMe and broke into new retail space they were not able to penetrate before. Find out how rebranding and getting RangeMe Verified™ helped Pearson Ranch Jerky scored a deal with Giant and other retailers. Running a ranch and raising cattle runs in the Pearson family. Pearson Ranch was founded by Marvin’s great uncle, Ken Pearson, in 1959 in New Mexico, and Marvin took over the fourth-generation ranch in 1984. 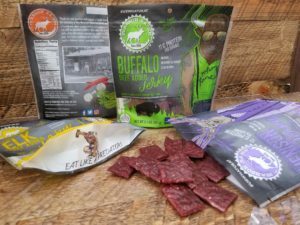 In 2000, Marvin added elk and buffalo to the animals raised on their ranch and started selling their jerky to Bass Pro Shops and Cabela’s, but he considered it to be “just a sideline, not really a serious business.” So, when his son, Matt Cromwell, came to him in 2012, sure that they could “sell this stuff anywhere,” Marvin was skeptical. Luckily, his son turned out to be an excellent salesman, and Pearson Ranch Jerky turned out to be quite popular. “I was proven wrong,” Marvin happily admits after his son spent a year successfully selling the jerky right out of his pickup truck to convenience stores and at truck stops. With these initial wins under his belt, Marvin was ready to take the brand to the next level and actively pursue other retailer placements. After hearing about RangeMe, Matt set up their brand page and product listings. He was discouraged by the brand’s lack of traction at first. However, several months later, Pearson Ranch Jerky decided to rebrand. “Millennials are the ones buying jerky,” Marvin explains. 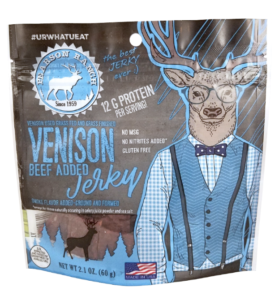 To target these consumers, Pearson Ranch Jerky came out with quirky new product packaging featuring cartoon animals and the accompanying hashtag #URWHATUEAT. They also removed nitrites and nitrates from their jerky and lowered the sodium content by using sea salt and celery powder to make the product all-natural and more appealing to health-conscious consumers. Sure enough, this Millennial-minded rebrand did the trick. As soon as they updated their products in RangeMe with their new packaging and got Verified they started getting buyer interest. It turned out to be a great decision for Pearson Ranch Jerky. After rebranding and getting Verified, a buyer from Giant, a subsidiary of Ahold, reached out to the brand through RangeMe. Once they had connected and requested samples through the platform, they moved forward with the deal in-person and brought the jerky into their stores. “Dollar for dollar, RangeMe is the best spend you’ll ever make.” Moving forward, Marvin is excited to continue the success of the Pearson Ranch Jerky brand, while expanding Pearson Ranch’s ranch operation itself, with the help of his sons Matt and Brandon, wife Yvette, brother Bret, and other non-family team members. In addition to the original New Mexico location, they recently acquired another ranch in Missouri to keep up with growing demand for their jerky and continue raising their natural, grass-fed animals. Marvin and Yvette are focused on getting the new ranch fully up and running, while his team continues winning new retailer placements and reaping the rewards of RangeMe.